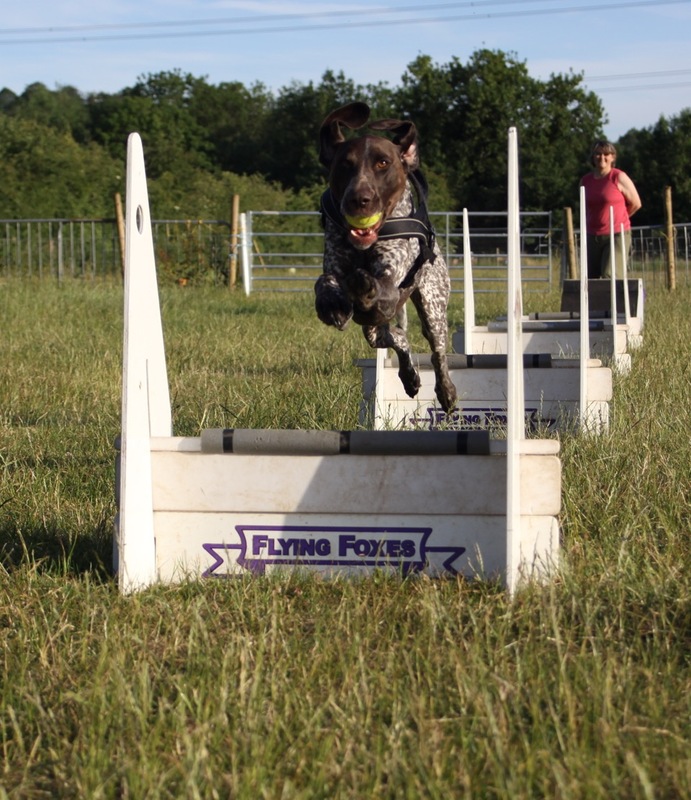 Flyball, a sport for the GSP? – Of course it is! Flyball is the most unique and exciting dog sport invented. It’s fast, colourful and very noisy. First seen in California in the 70’s, when a man called Herbert Wagner invented a ball launcher for a demonstration at his Dog Obedience Graduations. It was fun for the dogs and the owners and the onlookers loved it and as a result he was asked to go on US TV and flyball grew from there. The sport took off initially in Canada and North America in the 80’s and in the UK in the early 90’s when a group of enthusiasts formed the British Flyball Association (BFA). Today Flyball is the fastest growing dog sport in the UK with some 490 teams across the country taking part in competitions. Flyball, in basic terms, is a 4 dog relay race over a lane of 4 jumps. The dogs race against another team at the same time in an adjacent lane. The first team to get all 4 dogs up the lane over the 4 jumps, collect a ball from the box (spring loaded ball launcher), and then return back with their ball over the 4 jumps without any errors wins! There are many contributing factors which make for some very close and exciting racing for example dogs missing out jumps, dropping their ball, failing to correctly triggering the box, to the split second errors which are made when a dog gets a false start or an early change over on to the previous dog due to the laser beam start line technology. Many weeks, months and years are therefore put in to, not only training a flyball dog, but also their owners ensuring they race their dogs within the rules and learn how the other dogs in there team run. This enables swift, close changeovers between dogs, ideally the dogs noses passing tip to tip at the start line whilst they are running at full speed, to ensure the team get its fastest time and that all important win! Flyball is a sport enjoyed across the globe with many different breeds now taking part. 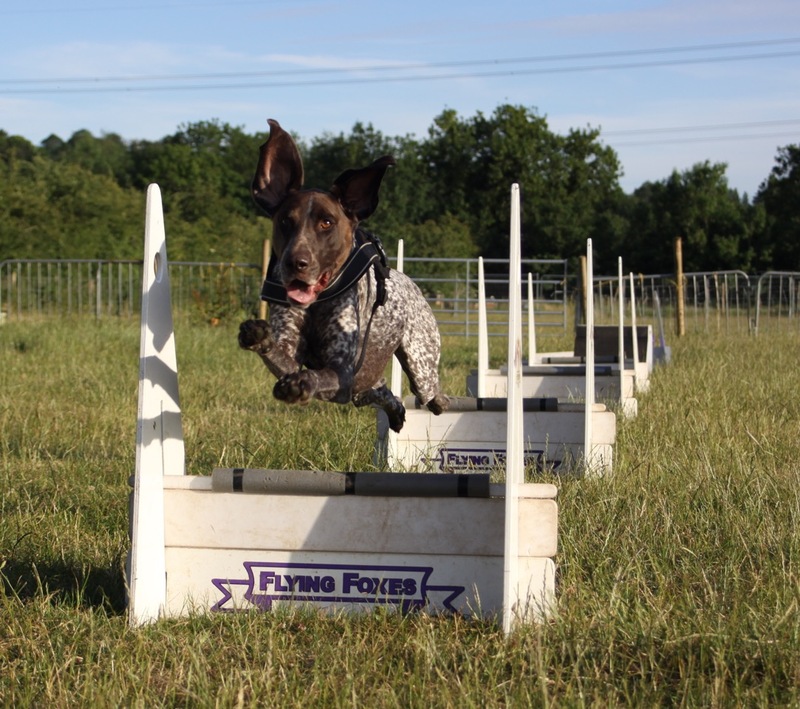 From Collies to Spaniels, to Poodles to Patterdales, anyone can have a go …….even the GSP!!! At this point I must introduce you to Alfie, my very handsome (even if I do say so myself) 4 year old GSP. Alfie was and is for most a member of our family, introduced as a loving pet, (a role that all GSP owners know they do so well!) After the first months of settling in we turned our hand (paw) to a spot of beating at a local shoot. This unfortunately didn’t last that long, not due to his behaviour I must add as he was perfectly behaved, but more to do with his …..shall we say singing, as Alfie believed it was much more helpful to whine at 100 decibels to let the guns know when a flush of birds had been spotted! A few weeks later it was my husband who noticed, (or maybe I should say ‘heard’) some dogs in our local park having a great time running, jumping and playing with tennis balls. We immediately looked into this as this could be a new way to allow Alfie to have fun but more importantly not be shunned upon for his vocal ability! Our Flyball journey had started. Having found the name of the local team, The Flying Foxes, it took only one taster session to get both Alfie and me completely hooked on the sport. It turned out that not only is Flyball fast and crazy but the other dogs and owners were too so we fitted in perfectly. The first few months of training focused on the basics of jumping the jumps without running round them, racing up close to the other dogs so they are all comfortable around each other and the part that Alfie and many other larger dog breeds struggle with, mastering the ‘swimmers turn’ on the box. After a few months of practicing we were told that we were ready to compete in our first ‘starters’ competition (where nets are put up to help the dogs stay in their lanes) and Alfie didn’t put a paw wrong and his team came first! Not long after this and having become members of the BFA , we were able to compete in the real thing and Alfie was now classed as an ‘Open’ competitor! This meant no support nets, no failing to trigger the box incorrectly and the most scary bit – racing against advanced dogs. However my fears were short lived as Alfie did not fail to deliver the goods time and time again! The joy the sport gives him is so clear to see, as he runs full speed down the racing lane with such enthusiasm, and the look of pride in his eyes when he brings his ball back to me, its priceless. Over the following year Alfie and I have competed in BFA competitions with his Flying Foxes team mates all around the southern part of the UK collecting many rosettes and flyable points which each dog in a team is awarded for successfully racing at an event. These points then relate into milestone awards throughout a dogs Flyball career. 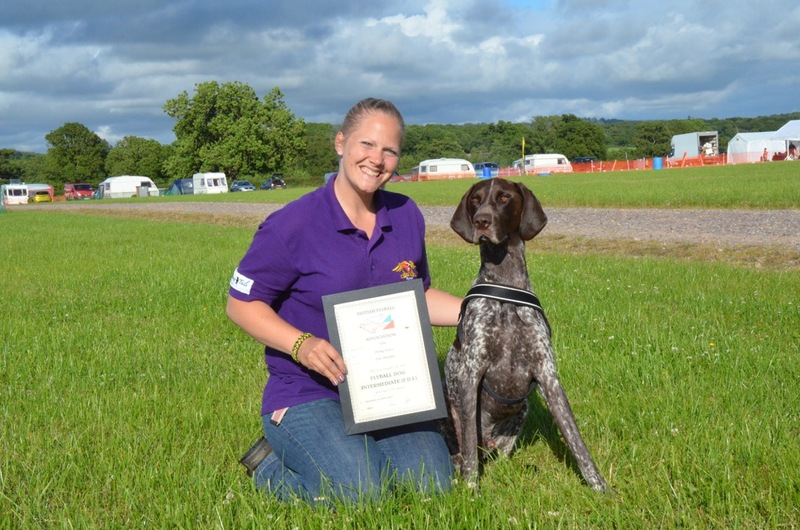 This year Alfie gained his 2nd milestone award of ‘Flyball Dog Intermediate’ as a result of great racing at high speeds. With lots more competitions planned for this year I don’t know how long it will be before we reach our next award but what I do know is that whatever happens it will be a fun, fast, noisy journey which Alfie and I will enjoy together and I can’t wait!